In many people, mild allergic reactions to pollen, mold, pets and other allergens grow worse from prolonged exposure. Continual contact or periodic episodes of intense exposure can bring on stronger allergy symptoms over time, whether or not patients manage their illness. If this situation persists, lung damage can result. Untreated allergies also pose the risk for recurring health side effects that include skin, ear and nasal discomfort and infection. Medication and lifestyle adjustments can prevent common complications of long-term allergies. Allergic contact dermatitis usually presents such uncomfortable symptoms that patients voluntarily end exposure to the substance that caused it, such as latex, essential oils and certain plants. Untreated allergies in the skin will fade, the University of Maryland Medical Center notes, but will recur the next time the patient encounters the substance. Prolonged exposure can result in chronic skin irritation, or neurodermatitis. The weakened dermal barrier may invite frequent bacterial skin infections along with allergic reactions. Airborne allergens such as ragweed pollen, mold spores, cat dander and dust mites affect the respiratory system, producing classic hay fever-type symptoms of sneezing, runny nose and congestion. Patients with untreated allergies or controlled long-term allergies can experience sinusitis or otitis media side effects, if exposure continues. 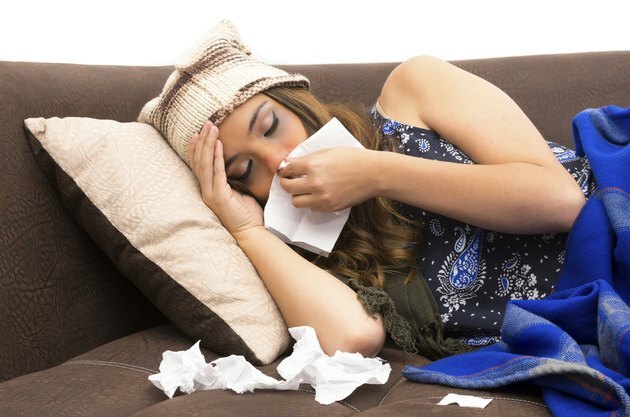 According to the MayoClinic.com, bacterial or fungal sinus and ear infections can pop up again and again in people with immune systems weakened by frequent allergic reactions. Prolonged mold exposure triggers long-term allergies and raises the risk of lung infection, or aspergillosis. When sensitive individuals inhale mold spores, these minute particles can lodge in the lungs and begin to grow. Patients with asthma or cystic fibrosis may have an immediate allergic reaction upon inhalation, the MayoClinic.com reports. Others may not know that fungal spores have invaded the lungs until a ball of mold growth damages lung tissue. Coughing up blood, trouble breathing, chills and fever may all occur. Medication or surgery may be needed to control and remove infectious mold growths. Untreated allergies make asthma patients sick more often and subject to severe, life-threatening asthma attacks. They can also give rise to more allergies to other substances, the University of Maryland Medical Center points out. People with long-term allergies whose levels of exposure remain extreme or periodically increase may develop hypersensitivity pneumonitis, a chronic lung inflammation. This often occurs in an occupational setting, such as inhaling airborne molds while harvesting grain or making wine. Pneumonitis can progress toward permanent lung damage and reduced lung function. What Are the Treatments for Black Mold Poisoning? What Are the Causes of Recurring Bronchitis?